Raking up the issue of black money, BJP's Prime Ministerial candidate Narendra Modi on Friday targeted the government for being unable to bring back the money stashed by Indian "thieves and looters" in foreign banks. He raised the issue while mocking at the excavation being conducted by the Archaeological Survey of India in Unnao in Uttar Pradesh after a saint said he had dreamt about 1000 tonnes of gold being underneath at a place there. "The whole world is laughing at us over this bizarre exercise. Somebody dreamt and the government has launched an excavation...The money hidden by thieves and looters of India in foreign banks is much more than 1000 tonnes of gold. If you (government) bring back that money, you won't have to do digging for gold (in Unnao)," Modi said while attacking the government. Addressing a gathering in Chennai, the BJP leader said a "cyclone of change" has gripped the nation. 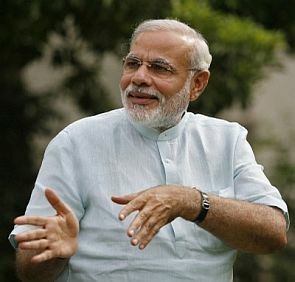 He referred to the cyclone 'Phailin' which recently hit Odisha and Andhra Pradesh and said it did not make much impact as the "cyclone for change" is already underway in the country. He said "people are dreaming of Congress-free India" and Tamil Nadu, where BJP has little presence, is also part of this wave. "In north India, nobody believes that even in Tamil Nadu there is a wave of change," he said and referred to his big rally in Trichy a few weeks back to buttress his point.